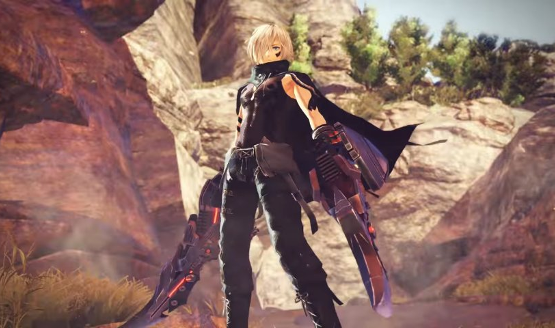 After showing the world premiere gameplay footage of God Eater 3 last week, Bandai Namco has just provided more details on things that were shown in the footage at the latest Weekly Famitsu magazine, from the new God Arc weapon types to the gameplay features. First of all, the new dual blades melee weapon type that has been shown since the first reveal is now officially named Biting Edge. Other than the separated dual-wielding style, they can also be combined into a double-edged glaive. The Glaive mode has wider attack range but will not recover stamina until the blades are disengaged. You can also stay airborne by using this weapon. The article also explains the new projectile weapon type Ray Gun. You can shoot laser continuously while moving, and the laser will grow bigger the longer you shoot. However, of course, it also gradually depletes your Oracle Points (OP), and once you run out of OP or stop shooting for any other reason, the laser size will revert back to normal. The new gameplay features shown in the footage are also explained in detail; the first of which is Accel Trigger, which gives enhancements to players if they are able to accomplish difficult feats. For example, successfully performing a Just Guard will activate a Guardian Accel Trigger which raises the player’s attack power. If you bring an ally character with you, you can fight while staying close to them to fill up an Engage Gauge. Once the gauge is full, you can initiate Engage to connect with them and share buffs with each other. This article also details on how even normal Aragami monsters cannot survive in Ash Regions, where the atmosphere is so hot it turns everything into ashes. The new Ash Region Species have cores which are formed differently from other Aragamis so they are exempt and can withstand activities in the Ash Regions. Other than the widely-known Anubis, the magazine also introduces Ra, an Aragami that can control fireballs (and is also named after an Egyptian deity) as another example of Ash Region Species Aragami. God Eater 3 is under development for PlayStation 4 & PC via Steam and it will be released worldwide. However, Bandai Namco has not announced a release timeframe for this game yet.